It’s time to get away from it all! 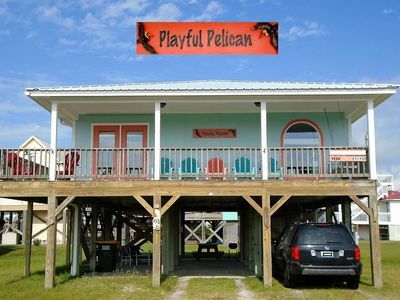 The Playful Pelican is located in Fort Morgan which is one of the quieter areas of the Alabama Gulf Coast, and one of the few areas where dogs are welcome. 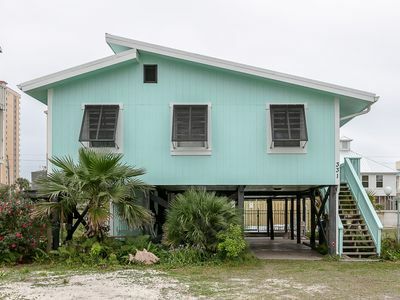 This two bedroom, two bath home is a mere two minute stroll to the sugar white beaches with no roads to cross and no traffic to negotiate – the sand and surf await you! 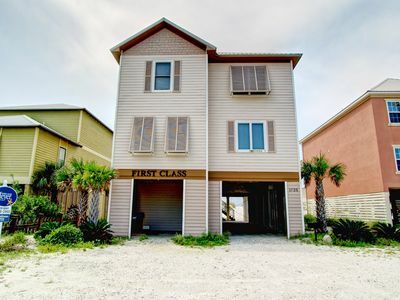 The Playful Pelican is approximately 1,100 square feet and features 2 bedrooms, 2 baths, and a spacious kitchen with new appliances and granite countertops. The kitchen has an open floorplan and adjoins the comfortable living room. 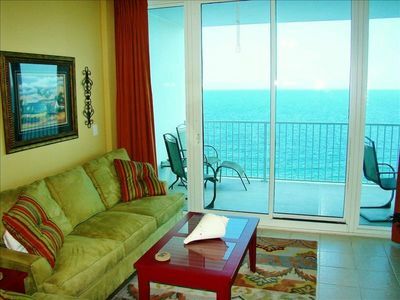 There are plenty of windows offering beautiful water views. 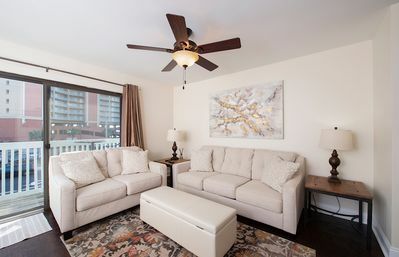 The open living room is equipped with a DVD player and a new 49" flat screen SMART HDTV, complete with a full package of Direct TV programming. In addition, there is free WI-FI Internet service, and a full complement of books and board games are available. The private Master bedroom offers a new king sized bed, its own 40” flat screen HDTV, a full bath, new end tables and chest of drawers, and a comfortable sitting area. It is a peaceful place to relax and read a good book. The Master bathroom has been recently updated with a fresh look and beachy décor. The second bedroom has a twin and full bunk bed, as well as a queen size bed. There is a new bedside table and tall chest of drawers, and plenty of room for the kids. They will love the turtles! A full bathroom is located off the hallway just a few steps away. The Playful Pelican is updated, freshly painted, and tastefully decorated throughout. 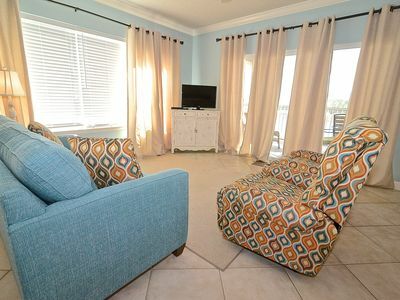 You will love the beachy decor. We recently installed beautiful porcelain tile flooring throughout and all new 3-panel Craftsman style interior doors. There is also a new Maytag washer and dryer conveniently located in the hallway closet. Outside, new stairs and deck railings have been recently installed. 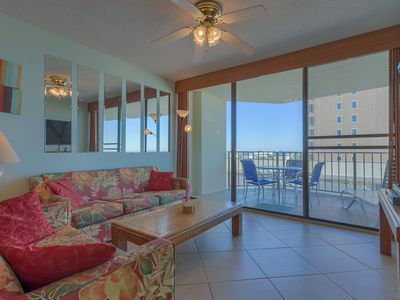 Also, there are some new windows, and the new screens allow for ample fresh, clean air offered up by the gulf breezes. 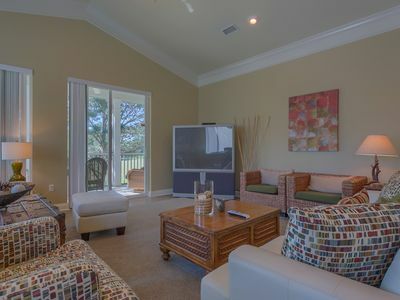 The large covered porch has views of both the Gulf of Mexico and Mobile Bay - the perfect place to unwindafter a great day at the beach. Sitting on the front porch swing and viewing the Gulf of Mexico and Mobile Bay at the same time is awesome. In addition, there is an outdoor shower, picnic table, Weber charcoal grill, sitting area, and concrete parking area under the house. You will find several beach chairs, umbrellas, carts, games, toys, buckets, shovels, boogie boards, and some fishing nets, along with many other items in the storage shed. And you don’t have to leave your house broken and well-behaved dog at home. Bring your dog on vacation with you! The Playful Pelican is pet friendly and even has two sizes of canvas dog crates available for use. 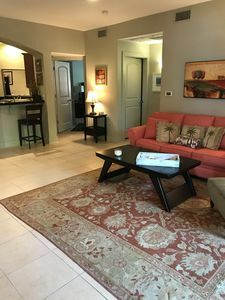 The Playful Pelican has their own cleaning technician/inspector and you will arrive to a clean house with fresh linens, bath towels, toilet paper, paper towels, and other amenities. Fort Morgan, unlike Gulf Shores, is known for less traffic, less noise, and fewer people on the beach – even during the peak summer season. 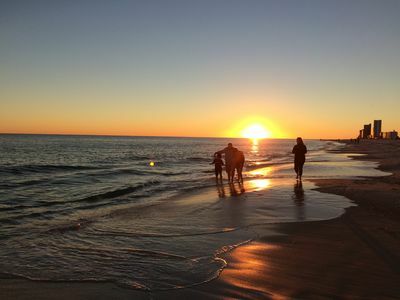 Why spend your vacation packed in like a sardine when the Fort Morgan beaches offer a chance for real peace and quiet? Grocery stores and restaurants are just down the road. 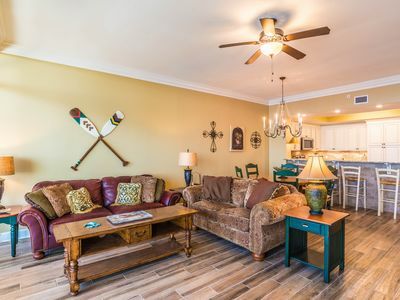 The Playful Pelican is located just twenty minutes from Gulf Shores, and less than five minutes from the Mobile Bay Car Ferry, which offers year round service across the bay to Dauphin Island and Mobile, Alabama. You may want to add a visit to Fort Morgan Historic State Park. It is adjacent to the ferry launch, and is approximately a mile from the Playful Pelican. In addition, Tacky Jacks restaurant is located just a short distance away with dining, cocktails and Thursday night karaoke. There is also the Sassy Bass Restaurant about five miles away with great 'catch of the week' dining. The Gulf Shores Yacht Club and Marina is less than a mile away. You can rent boats or charter fishing trips. Speckled trout, white trout, redfish, flounder, sheepshead, tripletail, bluefish, red snapper, pompano and king mackerel are common in the Gulf Shores area. 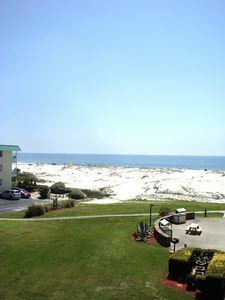 And, the gorgeous beaches of Ft Morgan, Gulf Shores and Orange Beach, Alabama, as well as nearby Perdido Key, Florida. 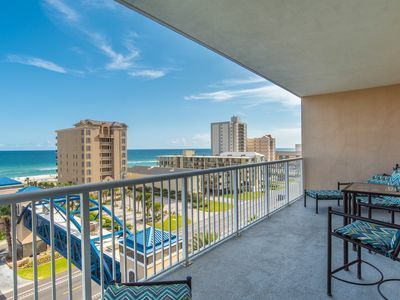 Sunshine, beaches, swimming, water sports, fishing, boating, dolphin cruises, parasailing, zip lining, marinas, bird watching, hiking, biking, shopping, dining out, and tropical breezes await you. For the early riser, the breath-taking sunrises can be enjoyed on the covered front deck while sipping your morning coffee. 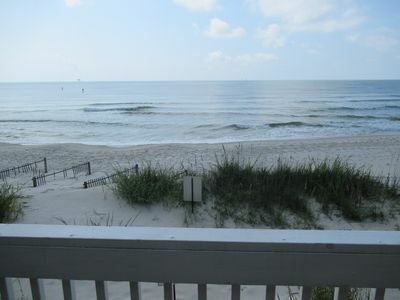 If you prefer watching the sun rise over the gulf waters, it’s only a two minute stroll to the beach. You just might see the dolphins playing close to the shore. If you dream of getting away from the pressures of everyday life, the nature and serenity of Fort Morgan is just what the doctor ordered. Stroll along beach and enjoy the sugar white sand and salty air. If you walk towards the point of the peninsula at dusk, from the surfside or the bayside, you will see the most beautiful sunsets you will ever see. 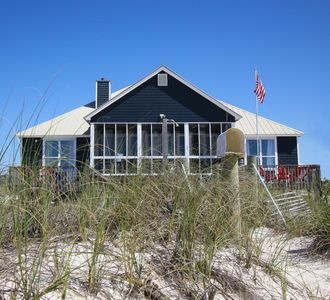 The Playful Pelican is available for rental year round. We love snowbirds! 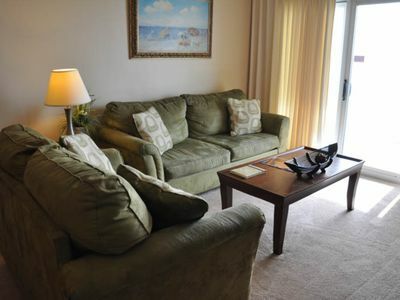 What makes the Playful Pelican great for snowbirds is that it’s big enough to make a comfortable home-away-from-home. 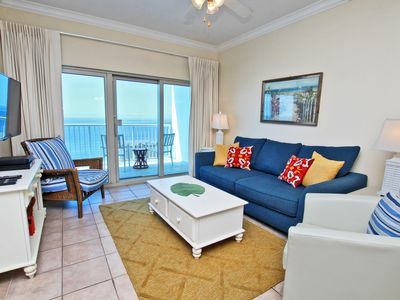 Please come make the Playful Pelican your vacation home. 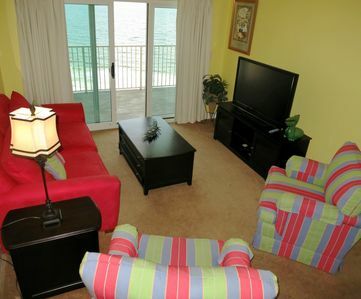 Mini Penthouse * Direct Beachfront * Only 5 star reviews! 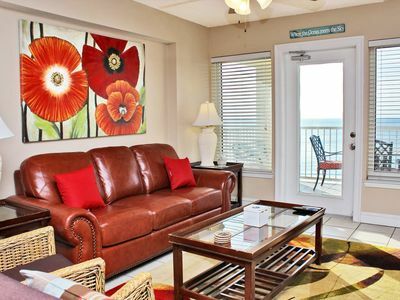 Apr/May $199 night! Endless Fun with Heated Private Pool! 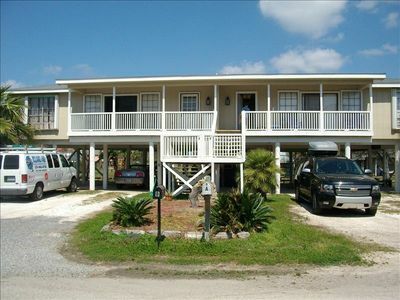 3 Bedrooms and Great Price in popular Gulf Shores!